A number of people have asked about the progress of my walk, and also how I plan to finish the walk. I haven’t been able to give more than vague answers, but at this point I think I can see that I have one long and three short walks left to do to complete the walk of every Berkeley street and path. These include several streets surrounding the Clark Kerr Campus of UC Berkeley, a small group of streets off Tunnel Road in Claremont, and a longer walk in the Berkeley hills near Grizzly Peak and Wildcat Canyon roads. I had not been sure what I would do for my final walk, but when I was reviewing my marked-up map I realized that I had not walked the Bay Trail south from the I-80 bike bridge to the Emeryville border. I’ve walked throughout the Marina (which might not be entirely accessible for awhile due to the recent oil spill), and on the Bay Trail north to the Albany border. At this point for my last walk, I am planning to do the remaining section out and back that then end at the bike bridge, which is one of my favorite features in Berkeley. Timing wise, my goal is to be done by the end of the year, which shouldn’t be a problem. The most difficult walk will be the one in the hills. That section has taken much, much longer than I expected. Each time I go up there, I only end up doing part of my originally planned route due to confusing intersections, lack of street signs, and lots of hills. I really thought that I would be finished with that section on my last walk, but four hours later I still had a bunch of streets left and decided to head home. 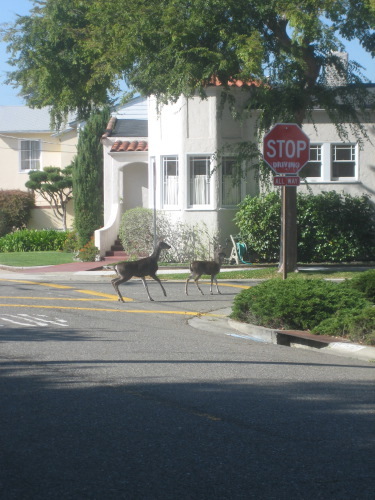 It is not unusual to see wildlife, especially deer, up in this section of the hills near Tilden Park. However, I did not see any the entire time I was walking early on a Sunday morning. 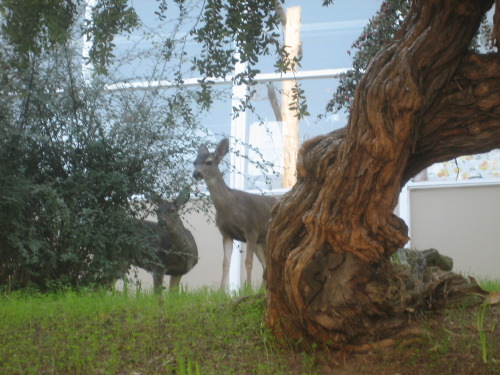 Surprisingly when I got down from the hills and was near Sacramento and Hopkins I spotted deer near behind some trees at a school. I watched for awhile, and they eventually ran down the middle of the street a ways and into someone’s back yard. I couldn’t figure out how they got so far away from any wooded/natural area, nor how they would get back, but hopefully they ended up getting there. Oh, and I inadvertently captured in the second photo one of the modified “Stop Driving” signs that appear throughout Berkeley.